The Museum occupies the suppressed church of St Anne; it is filled with an interesting collection of ancient remains discovered in or near Arles, a large proportion in the theatre, including a very rich marble frieze and numerous statues whose merit as works of art is small, except a head of a female, a goddess or the Empress Livia without a nose, and a head of Augustus found in 1834 belonging to a torso previously sent to the Louvre, both very fine. 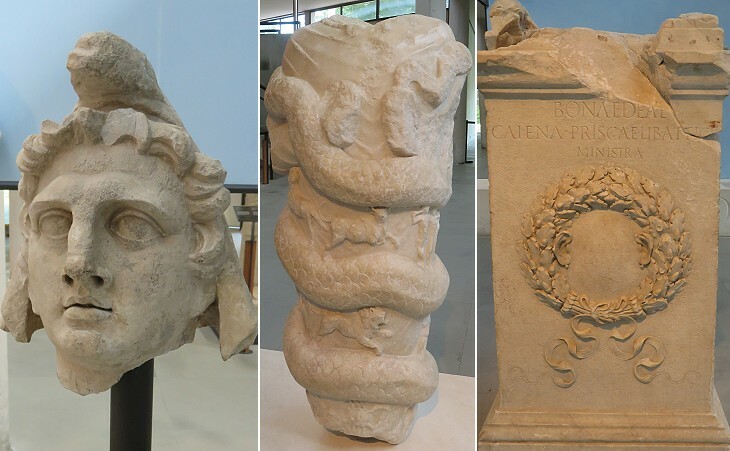 The first archaeological museum of Arles was established in a deconsecrated church, similar to what occurred in many other towns of France, e.g. at Vienne, Avignon and Narbonne. In the 1980s the exhibits were moved to a new building near the ancient Circus. 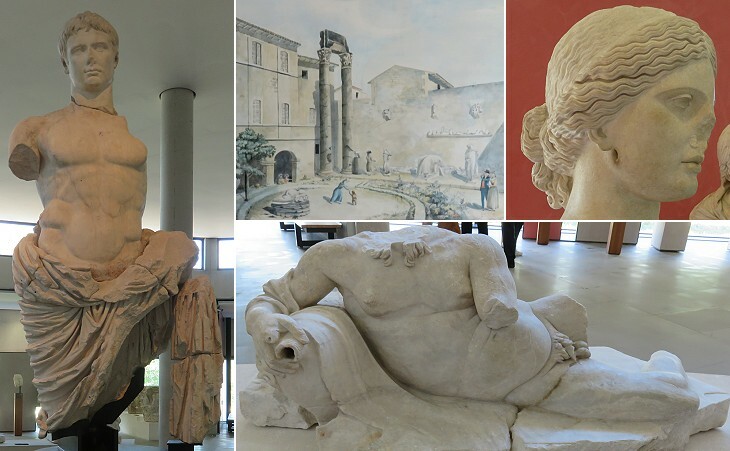 The decision to create an archaeological museum at Arles was prompted by the very large yield of the excavations carried out in the Theatre after 1822, although some items were sent to the Louvre in Paris. 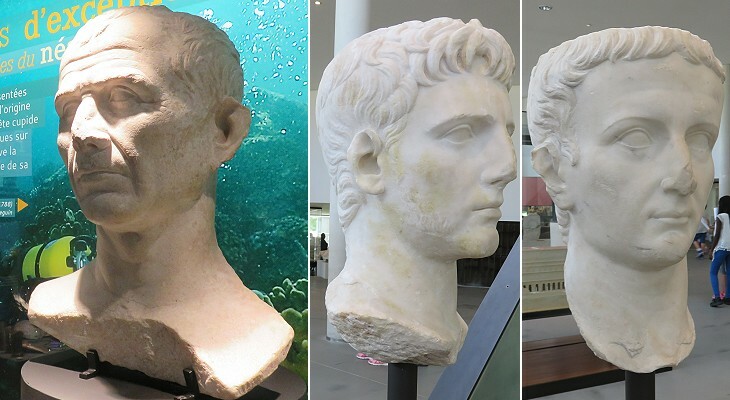 The statues of emperors and of their relatives which archaeologists find in a town of the Roman Empire are evidence of its period of greatest development. At Perge and Sagalassos in today's Turkey, archaeologists found statues of emperors of the IInd century; at Arles, and in general in Provence, the statues portrayed relatives of Emperor Augustus, thus suggesting that the region reached the peak of its economic development in the early Ist century AD. The Circus of Arles is dated 150 AD, but most likely it was not the first one of the town. 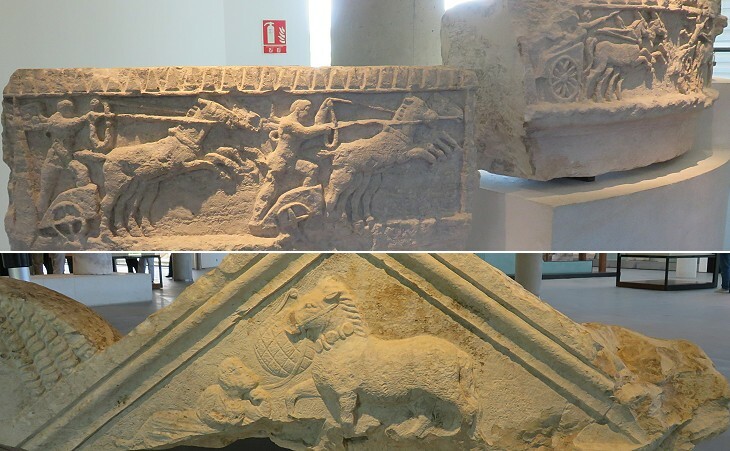 Camargue, the marshland between the two arms of the River Rhône was known in Roman time for its horses; they were used both as pack animals and for the cavalry; a sarcophagus suggests that they were also trained to race in the circus. We know from literary sources that these horses were highly praised in the IVth century. They are still bred today and are part of the local folklore. In the Town Hall a votive altar inscribed to the Bona Dea by her priestess, is remarkable for an oaken crown, that surrounds the inscription, and two human ears with ear-rings. The cult of Mithra was spread at Arles in the IIIrd century AD by soldiers or seamen who came from the eastern provinces of the Empire, similar to what occurred in other western towns, e.g. at Merida in Spain and at London (it opens in another window). The puzzling image of a human body in the coils of snake was first found at Ostia where the body was completed by the head of a lion, hence Leontocephalus meaning having a head of lion. 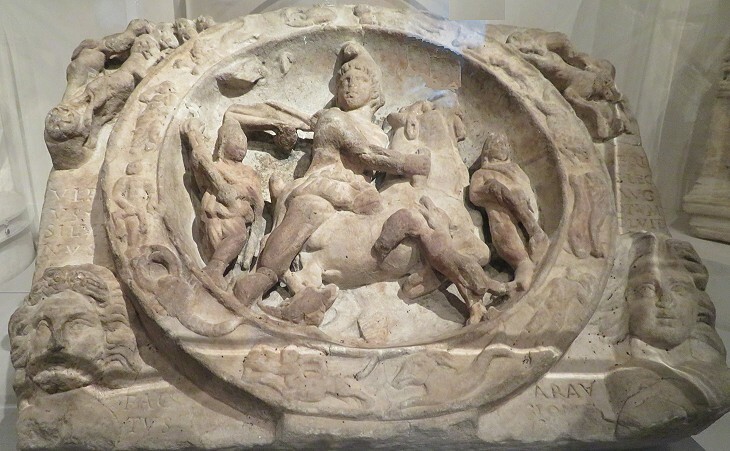 It is associated with the worship of Mithra, as it was usually found in mithraea. Bona Dea was an elusive ancestral Roman goddess; her cult spread to Provence because of the trading links of the region with Rome. The ears mean that the goddess listened to the prayers of her worshippers. Because of its position near the mouth of the River Rhône, Arles was with Marseille and Narbonne, the most important Roman harbour of Southern France. Goods carried by sea ships were moved to small boats which could be towed upstream and reach the inland towns (see a relief in the Lapidary Museum of Avignon). A similar change of vessel occurred at Ostia as shown by a local mosaic. Arles was also a port of call for ships on the route between Spain and Italy and one of export for the products of Gaul and Germany. The Necropolis of Alyscamps can be compared with that of Al-Bass at Tyre for the number and quality of Roman sarcophagi which were found there (the finest ones are at the National Museum of Beirut). The move to the Christian faith did not cause a major change in the design of sarcophagi. 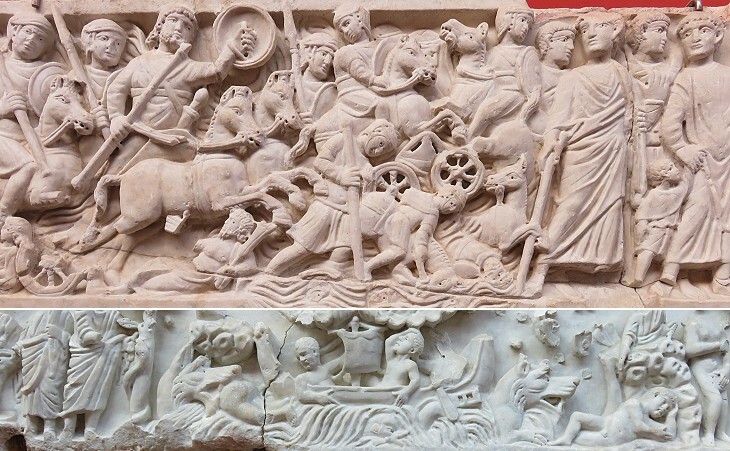 The Passage of the Red Sea replaced the scenes of battles which were very popular in the last Pagan sarcophagi, e.g. 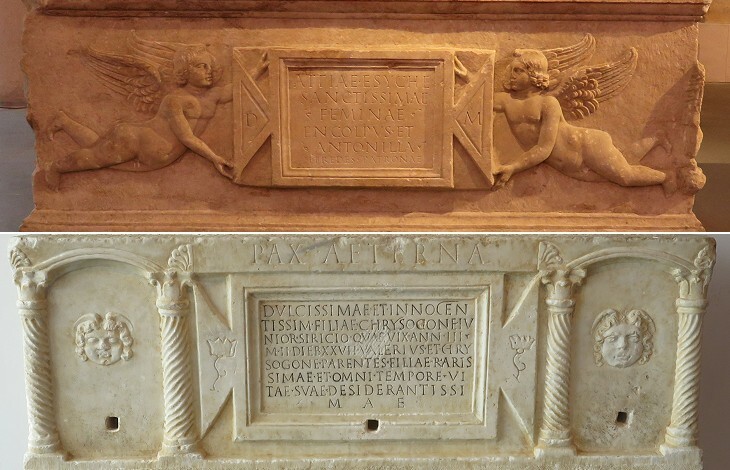 Sarcofago Grande Ludovisi; also the use of a very large sarcophagus as that shown in the introductory page was not new (see Sarcofago di Portonaccio). The partition of the box of a sarcophagus into niches by using columns and arches is known as Sidamara pattern, after a small town in Turkey where this type of sarcophagus was first found and studied. It was often used to depict one of the Labours of Hercules in each niche. 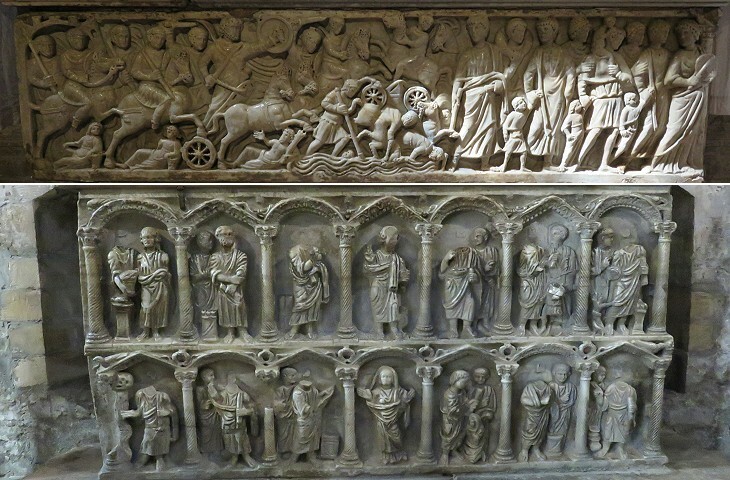 It is possible that the workshops of Arles offered their customers the same type of sarcophagus, irrespective of their faith. The sarcophagi shown above could have been utilized for a Pagan as well as for a Christian burial, the only distinctive mark being the acronym D(iis) M(anibus) for the Pagan sarcophagus and Pax Aeterna for the Christian one. It is interesting to note that the latter was decorated with heads of Pagan Gorgons that were thought to chase evil spirits and that the box had holes for profusiones, a Pagan funerary rite (see a page talking about funerary rites and the manufacture of sarcophagi in the Roman Empire). The move to the Christian faith was preceded by changes in the traditional Pagan religion; deities and cults which in one way or another suggested some form of life after death became very popular. In this sarcophagus the soul of the dead is personified by Psyche whose butterfly wings are a reference to the traditional depiction of the soul leaving the body as a butterfly leaving the chrysalis. Psyche crosses a gate which symbolizes the end of life and is accompanied by a psychopomp, most likely Hermes. Two angels are waiting for her: one holds an upside-down torch, another symbol of death; behind them a bush of roses indicates eternal happiness. Cuisine au beurre ou à l'huile? France is divided between the northern part of the country where cooking with butter prevails and the southern one which is still influenced by the Greek and Roman introduction of olive trees. 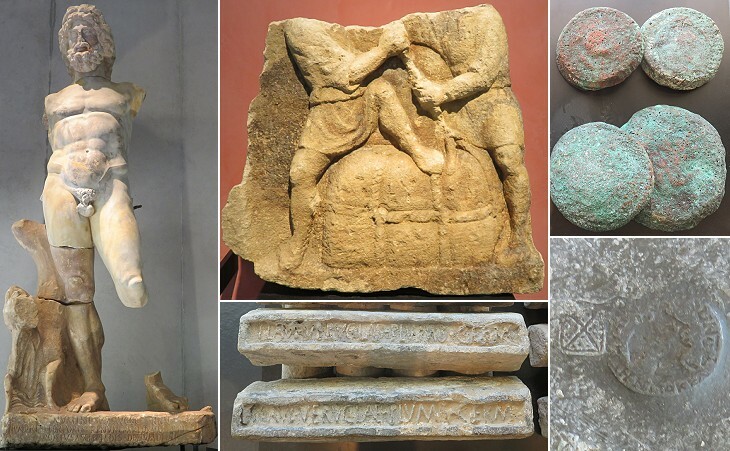 Olive oil was perhaps the most widely traded commodity of the Roman Empire, mainly because of its use for lighting. You may wish to see a fine mosaic showing farming activities in an olive grove at Caesarea Mauretaniae, today's Cherchell in Algeria. 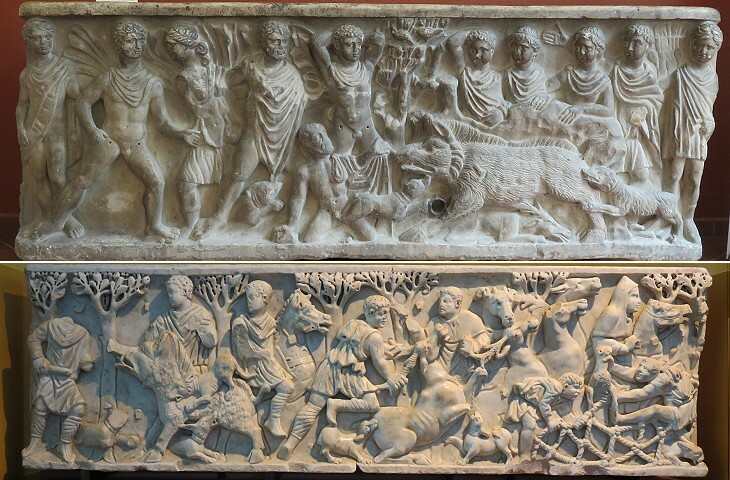 Sarcophagi with hunting scenes were very popular throughot the Roman Empire; initially they depicted scenes linked to mithologycal events, e.g. the Death of Adonis or the Killing of the Calydonian Boar. In the IVth century AD these scenes became more realistic: the hunters were no longer portrayed without clothes and the technique for killing or capturing the animals was less heroic and more effective as it involved the use of nets. 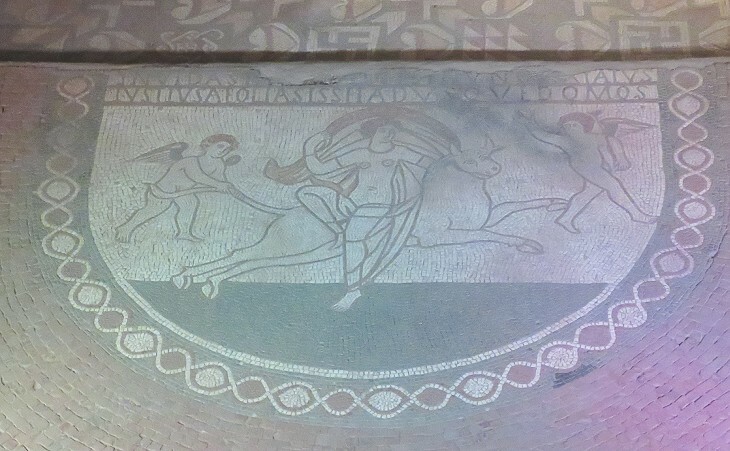 A mosaic at Ippona in Algeria shows how wild animals were captured alive for the venationes in the amphitheatres. Trinquetaille was a neighbourhood of Arles on the other side of the river where archaeologists unearthed many luxury Roman houses; most likely this wealthy population had a small nearby necropolis which was used at an earlier time than Alyscamps. A sarcophagus depicting a famous Greek hero who was made popular by a tragedy by Euripides was most likely regarded as a sign of distinction by the inhabitants of Trinquetaille. 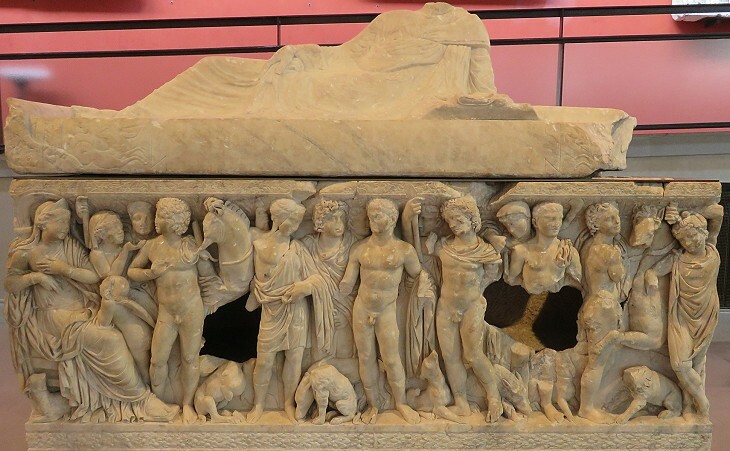 Very similar sarcophagi can be seen at Tarragona, Tripoli, Capua and Agrigento. The subject was depicted also in mosaics, e.g. at Paphos (with Ovid's account of the myth) and at Madaba in Jordan, the latter in the VIth century in a Christian context. 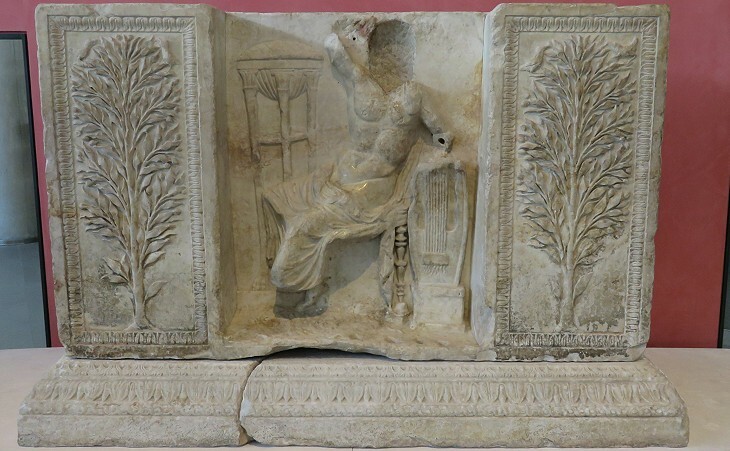 Many sarcophagi of Arles were made of Luni or Pentelic marble, but this per se does not mean that they were made in Italy or Greece, but the sarcophagus of Hippolytus, because of its lid which showed the dead attending a funerary banquet, was most likely made abroad (see a sarcophagus from Perge). The finest floor mosaic found at Trinquetaille shows at its centre a seated young man holding a circle with the Zodiac signs. He is supposed to represent Aion, the passing of time or more specifically Annus, the passing of a year. 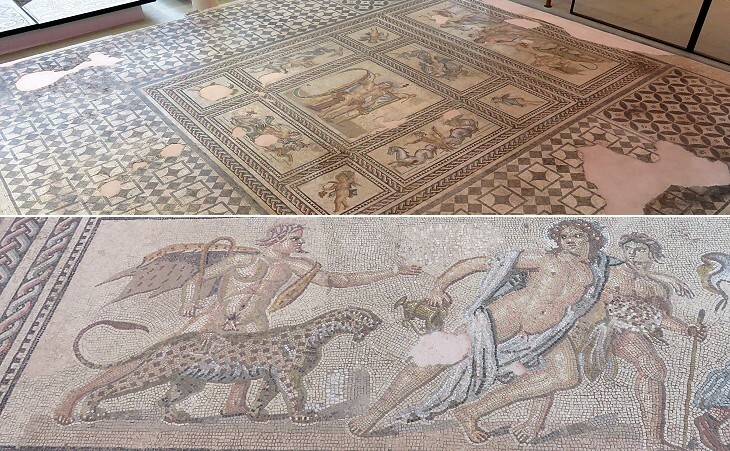 The mosaic shows also Silenus, a panther, Dionysus and Ampelos, a young satyr; scenes related to Dionysus can be noticed also in the mosaics at the House of Aion at Paphos. 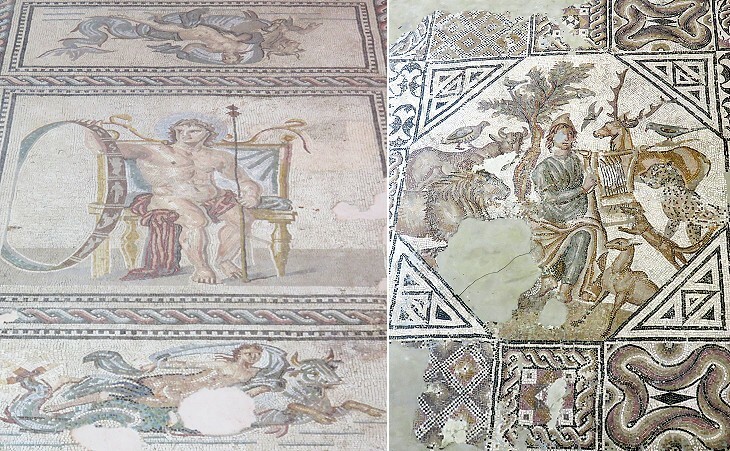 In the Roman Empire there were two "centres of excellence" for making mosaics: Antioch and Carthage, by this meaning not only the cities, but also the nearby regions. 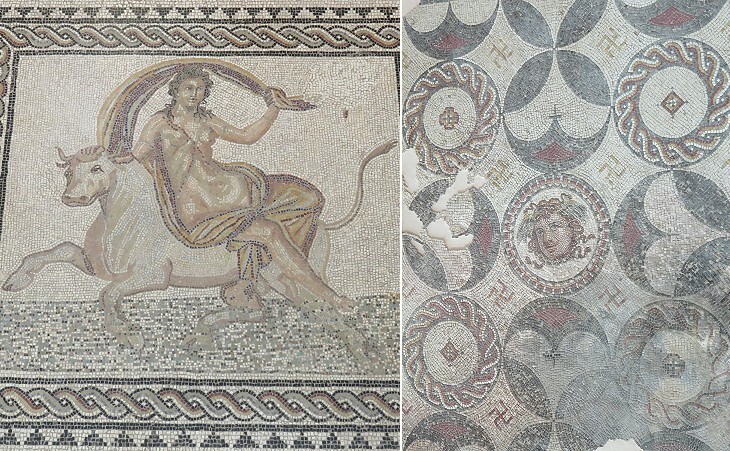 Mosaics were not the object of a trade, but some small sections with figures might have been shipped to other locations and drawings were most likely circulated among workshops. That can explain why almost identical mosaics can be seen in very distant locations (see an example related to Empuries and Pompeii). The Orpheus of Trinquetaille was portrayed in a posture which is very similar to the Orpheus of Philippopolis in Syria, although less well executed. The subject of Europa was quite obviously popular in Phoenicia, e.g. at Byblos, because the young girl was a Phoenician princess, but also in many other parts of the Roman Empire e.g. in Algeria, Northern Italy and even at Lullingstone, south of London (it opens in another window). 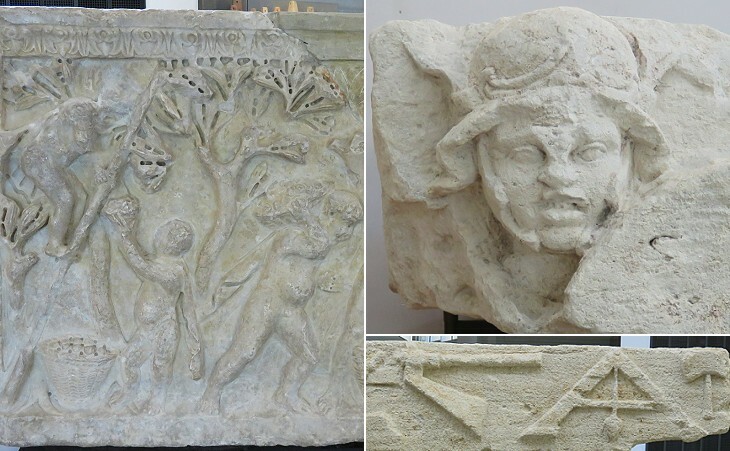 The image used as background for this page shows a detail of a late Roman capital at the Museum of Arles. Return to Roman Arles or go to Medieval Arles.